Needles and Hooks and Books, Oh My! : How Summer Flies. You can see some happy butterflies! I finally got the butterfly section to work on my summer flies. After frogging twice, I was ready to give up, but I gave it one more shot, putting more space between the first row of eyelets. It isn't perfect, but it's much better than before. The picture does not do this Candy Skein yarn justice. It's the June colorway, from my brother for my June birthday. Because my gauge is a bit different from the pattern's, I'm working additional butterfly and eyelet rows to make the most of my yarn. 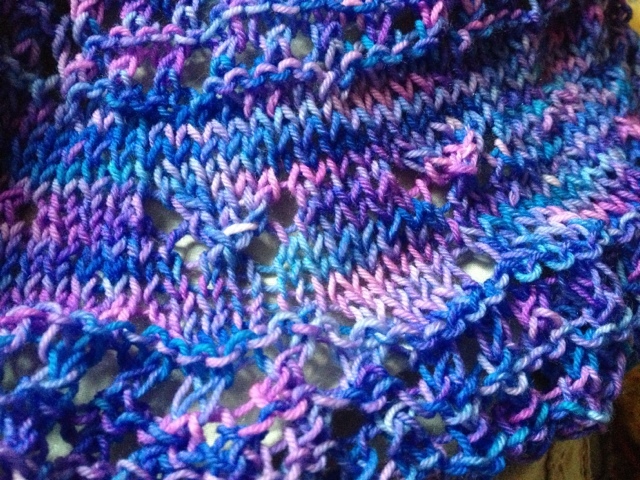 Besides, I *love* the butterflies, and I think that section showcases the yarn best. The weather has been cool; we're hoping it stays this way through my wedding next weekend. E's sister and family get into town sometime this weekend, and I expect I'll see a bit of them. Between moving and getting ready for the new school year and getting ready to get married, these next few weeks may be too busy for new yarn projects. With most of my stuff packed up, it'll be hard to start new projects anyway. I'm hoping being exclusive to one or two projects will help me finish them sooner. Linking up with Tami and Ginny! Happy wedding day for next weekend!!! I love the colorway and the pattern, I also love when I can do extra repeats :) Best wishes for a memorable ceremony. I love your yarn for Summer Flies ... gorgeous! I knit this a couple of summers ago, fun to knit! Oh! How pretty! And I can really see the butterflies! I knit this shawl earlier this year and LOVED it. I liked that it was fairly easy, but changed every so often to keep me busy and not bored.